I first posted this little tip in April 2010 and loads of people liked it. Originally it was for safely mixing a stereo source (e.g. MP3 player) to mono for input into a PA, desk or similar sound system. I'm using exactly the same principle here to mix the left and right channels of this little Alto Zephyr desk to a mono line out (small black box, bottom right of photo, contains the embarrassingly simple circuit). Why? Well, this is a great way to increase the number of inputs to your main PA. My main PA has six primary inputs. 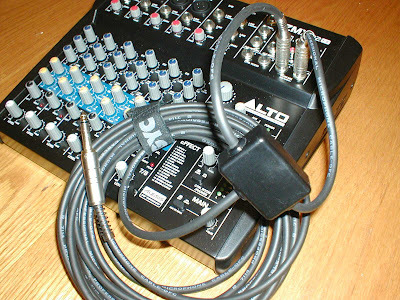 By plugging this little desk into one of the inputs (using my little mixer solution), I get 6-1+6 inputs, 11 in all. Of course, this solution is totally redundant if your sub-mixer already has a mono output but many little desks like this Zephyr do not have that facility. Another cracking wheeze is that, for simple session/open-mic work at local pubs, we can leave the big PA at home. Just connect the Zephyr to a single, powered speaker/monitor (using my mixer) and you've got a titchy, easy to transport PA with six inputs that keeps everyone happy. Many thanks to Rob Clark for explaining to me that grommets are not as challenging as they might first appear. Sure, as a sometimes-professional sound engineer I often welcome the prospect of having a single (or stereo if channels permit) drum sub-mix (also applies to Rick Wakeman wannabe keyboard players) but if the drummer decides that his snare drum isn't at a suitably eardrum-perforating level he will turn it up on his mixer, this providing you with a wholly unusable sub-mix on your single channel. The answer, of course, is simply to mute the drum sub-mix channel on your mixer. Or unplug it entirely, thus freeing up another channel for something more sensible, whilst still leaving the drummer with the impression that they are able to control and dominate. It's a battle of wits, but these are drummers we're talking about.